At Kean Coffee we love our regulars – our guests who come in so frequently and regularly, sometimes spanning many years, that we learn their names and they learn ours, often becoming good friends with our staff members. We value their input and enjoy learning more about them and hearing their stories. Meet Dwayne Carroll, a beloved regular at Kean Newport and Tustin! My first cup of Martin’s coffee was when the Diedrich Coffee opened at Marguerite Pkwy and Crown Valley in Mission Viejo. I was there on opening day. I remember the first manager – a very nice lady, however I can’t remember her name. This shop was always a meeting place for the neighborhood, and always full of young people from Saddleback college being so nearby, always a happening place. When I heard that Martin would be opening Kean Coffee, I felt it was a blessing even if it meant driving all the way to Newport Beach. 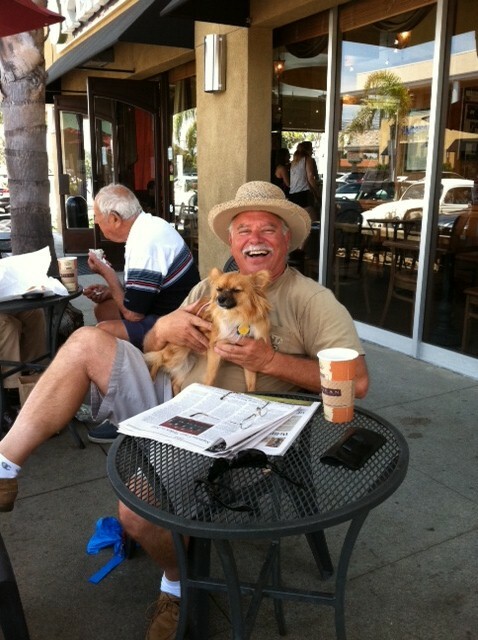 Then when the people of Tustin where able to talk Martin into taking over the original Diedrich location on Newport Ave. and he opened a second Kean Coffee there, it was even closer for me, as I live in Mission Viejo. I was thrilled. I go to Kean Coffee about five times a week, either location. Both are excellent for coffee, and a great staff that promote the quality product. As for me black coffee is my favorite. The best thing about Kean is the coffee, and having met so great people. Our dog is always treated well, with water bowls and tie down rings so you can go in and place an order. The other great experience was meeting my very best friend at Diedrich Coffee when he was going to Saddleback College as a student. Then when he graduated from there he went to Cal Poly in San Luis Obispo for two years. Then on to UCI in Irvine to get his Masters. Now he works for Oracle, a success story. When he is in town we now take a drive to Kean Coffee, like old times. Are you a Kean Coffee regular? If you would like to tell us your story and be featured in a future blog post, please let us know by emailing blog@keancoffee.com!